ZYPPAH or not? Which one is the best mouthpiece for the snoring people? Are there any FDA* approved MADs on the over-the-counter market? 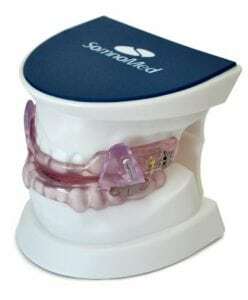 Neither of Mandibular Advancement Devices like Zyppah, Pure Sleep, Intelliguard Pro, SnoreRX or the other is legislatively approved for sale as the stop snoring AID except for SomnoDent. The FDA declares that mouthpieces for snoring must be prescription only and implemented by a doctor. Any self-fitting product bought in the market and self-diagnosed not by a dentist possibly may overlook more serious snoring consequence like Sleep Apnea. That is why none of the MADs You will buy will be FDA approved. The best "before You buy" action to perform is to consult Your dentist first. Do mouthpieces help with snoring? Yes, they do! In 80% cases, they work! Their efficiency depends on the functionality they may provide. How should mouthpieces for the snoring people work? What is the best mouthpiece for snoring? Zyppah or not? We've discovered that every month more than 30000 people are interested in Zyppah anti-snoring solution, this amount is greater than any other manufacturer has. Their website looks modern, and advertisement is promising. So We've decided to compare Zyppah with the other mouthpieces for snoring and find out is it the best, or not? The tongue stabilizer. Zyppah mouthpiece provides this unique characteristic. Adjustable Mouthpieces. Useful feature presented by Eliminator PRO and SnoreRX. They've solved the problem of re-positioning. There are ten incremental, 1mm possible adjustments, which people often need to increase over time and no other mouthpiece for snoring makes it possible. This feature comes with built in the calibrator. Custom Thermal Impression. Possibility to make the device fit perfect for every customer. Similar to professional dental expencive MODs which are custom made for Your jaw. This option is available for all featured types of mouthpieces for the snoring people. Ability to reset Adjustment. This option can save Your money. After wearing a mouthpiece for a while, it may become necessary to readjust it because wearing it may become uncomfortable. Mouthpieces without this function require buying a new device. SnoreRX, Eliminator PRO, and Zyppah make it possible approximately for three times. The absence of constant torsion and pressure will not lead to the future pain and tendonitis. All reviewed MODs provide that feature. SnoreRX and Eliminator PRO has dental lab quality design with advanced safety features. From the table above we can see all the functionality provided by the best Mandibular Advancement Devices on the market, but Let's define two finalists. The first finalist is Zyppah due to its unique tongue stabilizer. Now We need to choose between Eliminator PRO and SnoreRX. These two devices are too similar. But Our decision is - Eliminator PRO. The reason is simple. They have beneficial discount policy on Amazon and now it cost much less than SnoreRX. For the same amount of features, We think this is a reasonable economy. Now, let's compare the Zyppah and Eliminator PRO customers reviews to define who's the best. We've found It a hard challenge to make the proper analysis of the client's reviews for these products. Eliminator PRO is offering a free device replacement for a five-star review, so it is hard to define which of 139 positive reviews are true. Another thing We understand is - why would you want another of something if it didn't work? They also have 156 negative reviews, and they don't hide them at all, so all the cons are obvious and clear. Zyppah has 336 reviews on their website. It is unknown do they moderate reviews and leave only the best comments or not? We've read every review and found some independent opinions about these mouthpieces. Now We are ready to share with You only the approved information. Zyppah is definitely one of the best, unique and most efficient Mandibular Advancement Devices of nowadays. It has excellent durability. It combines Tongue Stabilising Device with mouthpiece and reduces snoring. But the absence of adjustment possibility makes it not perfect for everyone. You should remember that one of the the main points about MADs is personal compatibility. Of course, it is up to You to choose between more affordable and adjustable device Eliminator PRO or innovative and durable Zyppah. But today more and more customers starting to give the advantage to Eliminator PRO or similar design devices due to their customisable features. Snoring is Ruining Your Sleep: It’s a simple fact. You can’t sleep if you can’t breathe. Snoring is the siren that warns you and the world that your brain isn’t getting the oxygen you need when you sleep. If you or a loved one are snoring, then you're not getting the restful sleep you need to feel healthy and energetic all day. Sawing logs. Cutting Z's. Calling hogs. Whatever you call snoring, it isn't just annoying, it's bad for your health. Peaceful, restful sleep is so essential to the proper functioning of the body and brain, you've absolutely got to get that snoring under control. 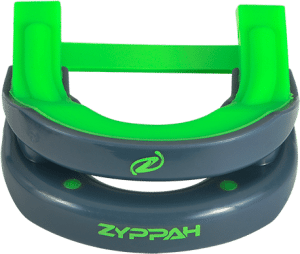 ZYPPAH Stops Snoring NOW: ZYPPAH is a simple mouthpiece you wear during sleep. It targets the two main causes of snoring to give you a peaceful, restful sleep each night. ZYPPAH works by controlling the tongue with our patented tongue-elastic we call the Snoring Eliminator. Invented by Dr. Jonathan Greenburg – a dentist with an undergraduate degree in biomedical engineering – ZYPPAH is the result of years of real world research in Dr. Greenburg's medical clinics helping patients with disturbed sleep conditions. As Seen on NBC Nightly News: ZYPPAH is already stopping snoring and creating great sleep for tens of thousands of customers - but don’t just take our word for it. Recently, NBC Nightly News tested several stop-snoring devices and discovered that only the ZYPPAH was the effective at stopping noisy snoring all night long. That's because ZYPPAH works differently than every other stop snoring product on the market by targeting 2 key causes of snoring. Restored Hope: After so many sleepless nights and failed snoring solutions, it’s easy to give up hope of ever getting a good night’s sleep again. But Dr. Greenburg’s technological marvel really does work, just ask thousands of happy ZYPPAH customers. Beware cheap imitations: The Genuine ZYPPAH is a safe and effective FDA Class II Medical Device that is 100% Made in the USA. Unlike other solutions and boil-and-bite mouth pieces – which can fix one problem and cause others (advancing the jaw too much, dry-mouth, mouth breathing, TMJ, headaches, teeth shifting, etc. ), Dr. Greenburg’s solution simply fits teeth like railroad tracks and keeps your tongue where it needs to be. 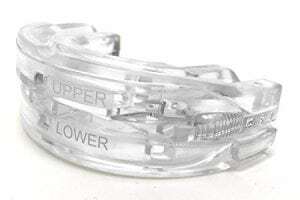 Eliminator PRO Night Guard Bruxism Sleep Aid is an Adjustable Mouthpiece and the most efficient up to date snoring solution on the market. This product has smaller dimensions than its competitors. This item operates well due to repositioning of your mouth ability. 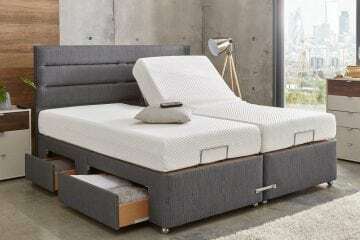 This action helps to open air passages which are closed by the soft pallet overnight. The general problem of the mouthpieces for snoring is the absence of the possibility of adjustment. They usually mold Your mouth with one setting of re-positioning. That may not meet Your individual requirements of comfort. 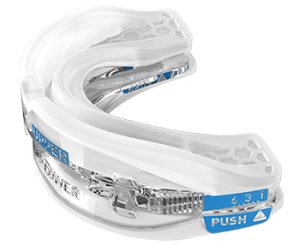 The Eliminator Pro Night Guard Bruxism Sleep Aid includes ten incremental, one-millimeter variety of re-positioning possibilities. Many customers will demand make additional adjustments in a while. Which can't be performed by the other MODs on the market. This Mouthpiece for Snoring has outstanding functionality with the unique feature of re-adjustment according to Your private demand. Accuracy. Boil the water, take the container which will be able to immerse Your mouthpiece and put Your Intelliguard PRO there. Now You'll be able to mold it to Your mouth. 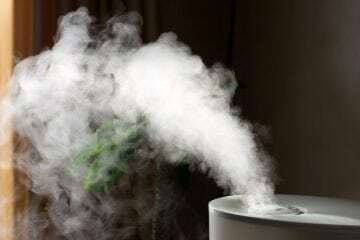 Just put it into another container with the regular temperature water and bite it. Lock technology. Precision lock holds Your mouthguard at your wanted setting. You can change it anytime. Innovative design. It makes Intelliguard PRO the most efficient mouthpiece for snoring on the market. Pure measurement. Easy to calibrate Intelliguard PRO to Your wanted settings. Bruxism assistance. Limits Your teeth from grinding overnight. A common problem for Mandibular Advancement Device users is that mouth may open while sleeping and mouthpiece will fall out of it. We recommend to use it with anti-snoring chin strap simultaneously. This combination may cause the double effect in Your fight against snoring. More information about the﻿﻿ best anti-snoring chin straps You will find HERE.